Welcome to this chapter in the LEGENDARY SURFERS series, on John Kelly! 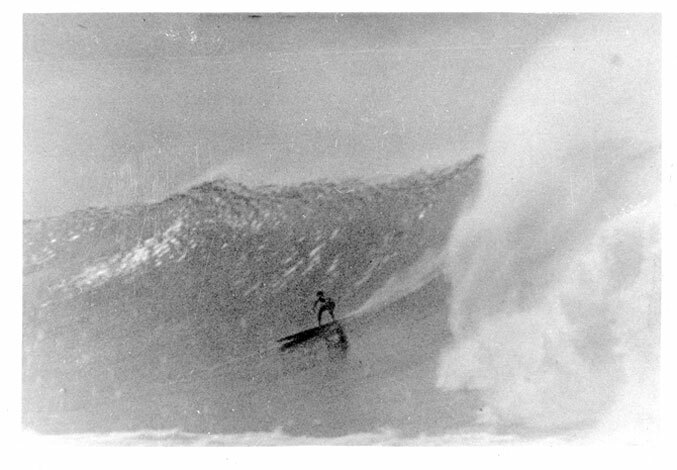 In early 1937, John Kelly, then a 17 year-old surfer from Black Point, made surfing history. As surf writer Matt Warshaw wrote, it was “a raw, satisfying, hugely important moment in surfboard design history” when he cut down the first Hot Curl. Kelly’s father was a Bay Area artist when he accepted a one-year job to create promotional illustrations for a housing development in Lani-kai, on the windward side of O‘ahu. His mother was also an artist and, shortly after their arrival on the island, promptly had an etching of the newly-opened Royal Hawaiian Hotel published in the local paper. “My parents weren’t really political,” Kelly, politically active himself at age 75 said in 1994. “They were artists, plain and simple. They loved people, and they loved freedom. They certainly had no problem, later on, with me getting involved with radical politics.” John’s father, John Melville Kelly, earned acclaim for his etchings of Islanders and for his designs on the menu covers of the Royal Hawaiian Hotel. His mother, Katherine Harland, was a noted sculptor. The Kellys soon moved a few miles east of Waikiki, to the Kahala section of Honolulu, building a shingled cottage at Black Point that overlooked the ocean. In the mid-1920s, after his mother gave him an old ironing board to mess around with, Kelly – aged five or six – first tasted the reef surf of Kahala. It wasn’t until he was nine that Kelly got his first real surfboard. It was a custom 7-foot redwood board shaped by David Kahanamoku, one of Duke’s brothers. Kelly’s dad drew “Keone” (“John” in Hawaiian) on the deck and John engraved the letters into the wood, himself. 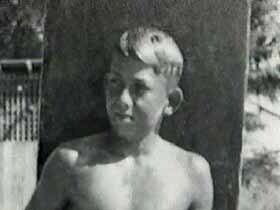 An old Hawaiian fisherman who lived in a cave near the Kelly home became John’s adopted grandfather and mentor, teaching the young surfer how to make both cotton and linen nets, and how to catch moi and parrot fish. From the Hawaiians and a group of Filipinos who had walked off the sugar fields, Kelly learned how to live comfortably around the ocean; useful things like diving to catch lobsters and picking tidewater limpets off the rocks. After the war he regrouped with his Hot Curl buddies and graduated from Roosevelt High School, earning a bachelor’s degree in music from the prestigious Juilliard School in 1950. For years he conducted symphonies and choral groups and served as the director of the music school at Palama Settlement. John Kelly went on to not only conduct symphonies, but write books and speak out against nuclear weapons, founding Save Our Surf, a grass-roots environmental group responsible for saving 140 surf sites on O‘ahu from development. Founded in 1961, Save Our Surf fought to prevent offshore development around the Islands that would have destroyed reefs, surf sites and other ocean resources. “I can’t imagine what this place (Hawai‘i) would be without him,” Downing added. At its peak, the group — which consisted of dozens of surfers, ocean-users and environmentalists — staged protests, organized beach cleanups and spread the word using posters and leaflets about development projects that would impact the environment. These activists helped thwart the state’s plans for a proposed reef runway from Wai‘alae to Hawai‘i Kai, a beach-widening project in Waikiki and evictions of families on Mokauea Island, which later became a historic site. In 1963, Kelly came up with a board that, while it never caught on, demonstrated his continued drive to experiment with wave riding vehicles. His “hydroplane surfboard” was a strange design, meant to combine the speed of a longboard and the maneuverability of a shortboard in its slightly raised tail section. 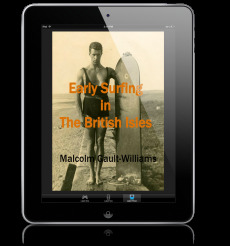 John Kelly also wrote books, most notable Surf and Sea, 304 pages covering nearly every aspect of the sport, published in 1965. Kelly’s speaking out against nuclear weapons and organizing others in the same pusuit allegedly cost him his job at Palama Settlement. “Good for him that he spoke against that racism, that arrogance, that insanity,” said Kathleen Kelly, who inherited her parents’ activism and was arrested at a Vietnam protest in 1967. When she called home from jail, her parents responded, “Good for you,” Kathleen said, laughing. In 2004, the Hawaiian Collection of Hamilton Library received a $3,075 grant from the University of Hawai’i-Manoa Diversity and Equity Initiative to digitize posters, fliers and other ephemera from Save Our Surf to preserve the history of this social and environmental movement. The collection is currently available online. Kelly continued surfing and later, swimming. For decades, he would jump off Kupikipikio Point, surfboard in tow, and catch waves at Black Point or Browns. As he got older, bodyboards replaced surfboards until he eventually ditched them both. Instead, he would climb down the cliffs, glide into the ocean and swim all the way to Ka‘alawai Beach. His wife, Marion, would walk from their home to the beach with his slippers and a towel. Then they would walk back to Black Point together. About 20 years before his death, Kelly was struck on the head by his own surfboard, leading to a decline in his mental capacity. Also, soon after the accident, he was diagnosed with Alzheimer’s disease. On top of that, in 1995, he found out he had bladder cancer. Just a few months before his passing, John Kelly, who was still lanky and nimble, would swim back and forth in the saltwater pool near his home at Black Point. He passed away quietly and peacefully, on his 64th wedding anniversary, at the age of 88. Warshaw, Matt. “20th-Century Radical,” The Surfer’s Journal, Volume 4, Number 1, Spring 1995, p. 29. Warshaw, “20th-Century Radical, The Surfer’s Journal, Spring 1995, p. 30. John Kelly quoted. Lani-kai, in the Mo-kapu quadrant. Development began here in 1924. The name was changed from Ka-’ohao to Lani-kai, in the belief that it meant ‘heavenly sea’ (Honolulu Advertiser, August 15, 1948). However, this was an English word order (in Hawaiian, the qualifier usually follows the noun). Lani-kai actually means “sea heaven, marine heaven” (Pukui, Elbert & Mookini, Place Names of Hawaii). Browne, Bud. “Surfing the 50’s,” videotape of the best of his movies of the 1950s, ©1994. Warshaw, “20th-Century Radical, The Surfer’s Journal, Spring 1995, p. 30. See picture of Kelly and his board, “Keoni,” at Waikiki on page 29. Warshaw, “20th-Century Radical, The Surfer’s Journal, Spring 1995, p. 31. Warshaw, “20th-Century Radical, The Surfer’s Journal, Spring 1995, p. 31. John Kelly quoted. Toth, Catherine E. “Hawaii surf activist John Kelly dies,” Honolulu Advertiser Windward, 2007. Toth, Catherine E. “Hawaii surf activist John Kelly dies,” Honolulu Advertiser Windward, 2007. Kathleen Kelly quoted. Toth, Catherine E. “Hawaii surf activist John Kelly dies,” Honolulu Advertiser Windward, 2007. Bill Paty quoted. Toth, Catherine E. “Hawaii surf activist John Kelly dies,” Honolulu Advertiser Windward, 2007. Fred Hemmings quoted. Toth, Catherine E. “Hawaii surf activist John Kelly dies,” Honolulu Advertiser Windward, 2007. George Downing quoted.